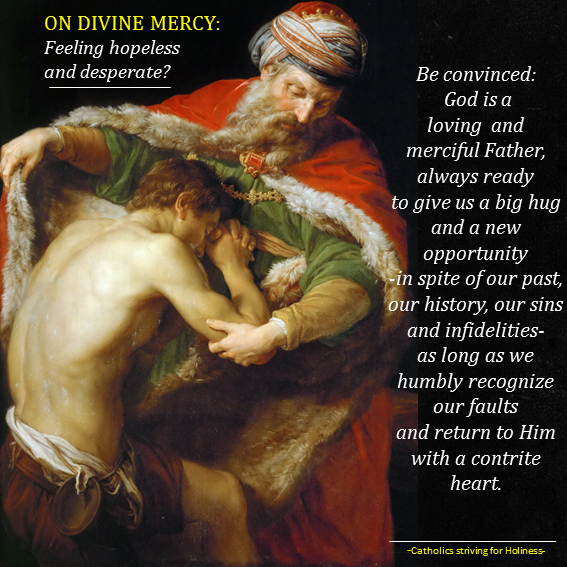 ON GOD’S MERCY: Feeling Hopeless and Desperate For Your Falls and Sins? Trust in God Who is Merciful, Receive His Pardon and Happiness in Confession! Dear friend, if ever you find yourself feeling hopeless and desperate for the burden of your sins and frequent falls, I encourage you to react and shake off this pessimism which is an ally of the enemy. Raise your spirit! Consider that God is truly merciful. Below are some words of Pope Francis in his Bull of Indiction for the Extraordinary Jubilee of Mercy, “Misericordiae vultus” (The Face of Mercy), n. 6 which I strongly encourage you to meditate. God’s mercy, is “concretely demonstrated in his many actions throughout the history of salvation where his goodness prevails over punishment and destruction. In a special way the Psalms bring to the fore the grandeur of his merciful action: ‘He forgives all your iniquity, he heals all your diseases, he redeems your life from the pit, he crowns you with steadfast love and mercy’ (Ps 103:3-4). Another psalm, in an even more explicit way, attests to the concrete signs of his mercy: ‘He secures justice for the oppressed; he gives food to the hungry. The Lord sets the prisoners free; the Lord opens the eyes of the blind. The Lord lifts up those who are bowed down; the Lord loves the righteous. The Lord watches over the sojourners, he upholds the widow and the fatherless; but the way of the wicked he brings to ruin’ (Ps 146:7-9). Here are some other expressions of the Psalmist: ‘He heals the brokenhearted, and binds up their wounds … The Lord lifts up the downtrodden, he casts the wicked to the ground’ (Ps 147:3, 6). Hence: cheer up! Stand up and return to the Father’s house for while there’s time, there’s still hope. Approach the sacrament of Confession with a humble contrite heart, like that of the prodigal son. Be convinced: God is a loving and merciful Father, always ready to give us a big hug and a new opportunity -in spite of our past, our history, our sins and infidelities- as long as we humbly recognize our faults and return to Him with a contrite heart, for His Mercy endures forever!